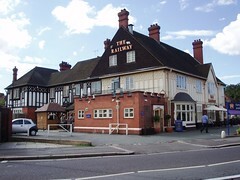 A large pub by Hornchurch Station, part of the Ember Inns chain (owned by Mitchells & Butlers). There are many large pubs adjoining stations out on the eastern stretches of the District Line, but this one does a pretty good job of being welcoming and comfortable. Bar staff were very friendly, and there is plenty of space to sit down (although no beer garden it seemed) photo of interior. Real ales on handpump in July 2008 were Adnam's Broadside, Greene King IPA and one called Leo Golden Mane, which presumably is a guest ale (£2.65/pint). There's also a wine list, with a few options. The food menu sticks to familiar pub options (ranging from £6-£8 for a main), with a decent selection of burgers in particular, which on the evidence of our group, were pretty good quality. The vegetarian burger (£6), didn't have a patty, but turned out to have a satisfying combination of mushroom, salad and mozzarella cheese photo. Last visited by Ewan, Jo and other Tube Walkers, 19 July 2008. Last edited 2013-05-10 07:53:05 (version 6; diff). List all versions. Page last edited 2013-05-10 07:53:05 (version 6).